I recently finished a big, text-heavy project and needed something frivolous to clear my head. Something fun, you know: visual, sports-y, design-y, kind of interesting to think about, quick and most importantly, completely hypothetical, non-sensical, and pointless. And so I give you the first (only?) edition of Soccer Out of Context – a look at how other identities and brand properties would appear in the soccer / fútbol aesthetic, instead of their own. For the introductory exercise, I chose my first sporting love, the Boston Red Sox, and their neighbor clubs in the baseball division they call home, the American League East. How would AL East teams be represented in a soccer context? I’m not reinventing club histories, or pretending clubs were soccer teams all along, just translating their brands to the soccer “universe”. I’m not changing logos, colors or visual properties – just trying to play within existing boundaries. Today I’m using soccer kits – jersey shirts only, really, as this was a quick exercise – as the visual output. One per team, too – no away designs this time. Where I can, I’m making guesses about the identities to fill in blank spots that don’t map easily over to soccer. I’m trying to have fun, and I don’t take this seriously as anything more than palate-cleansing design exercise. Here’s what I ended up with, in the order I think about the division. The Sox are one of baseball’s historically untouchable brands, along with the Yankees, Cubs, Dodgers, Giants, Cardinals and Tigers. They are very reticent to change their visual identity, and (much like their 101-year-old ballpark) have only recently augmented and tweaked it to keep it up to modern standards. The classic home jersey – wool white, with distinctive red letter and number typefaces, outlined in navy – hasn’t changed much in decades. (There were 70s-era pullovers, and a few years ago a special red “Kool Aid Pitcher” jersey was added, but all that is best left undiscussed.). The current branding makes the somewhat whimsical “hanging socks” logo the official mark (thumbs up! 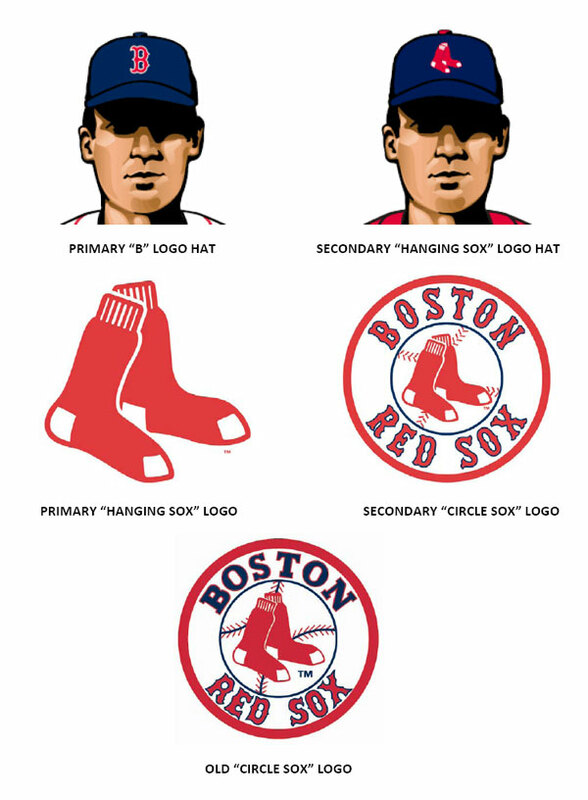 ), but the Red Sox are spoiled for strong identifiers: the pair o’ sox, those same two sox within a round seal, and the team’s cap mark, the distinctive, vaudevillian “B”, are all widely recognized and used to represent the club. Here’s what’s happening. In this world, the “Hanging Sox” mark becomes the team’s crest, which every good soccer team needs sitting over the heart. Above the crest, you’ll find three stars – one gold, two silver. American sports don’t do much of this, but soccer identities like to brag about how many trophies they’ve won, and the Sox, after a long wait, have a bit of bragging to do. The gold star stands for the five championships won in the B.F.C. (Before Fake Curse) era; the last of those was in 1918. The two recent silver stars stand for the World Series victories in 2004 and 2007, respectively. Mirroring the crest is the jersey maker’s logo. This brings us to another North American sport / soccer culture disconnect: fútbol clubs by and large make their own kit manufacturing arrangements; in baseball and other North American sports, manufacturers sign deals with entire leagues to make the uniforms for everybody. Baseball’s uniforms are made by Majestic, but I haven’t let that stop me here. This is a soccer context, so I used soccer rules; the Sox’ kit here is made by Warrior, the once and future lacrosse apparel maker who moved into soccer last year by scoring a big kit manufacturing deal with Liverpool. You know, the same Liverpool that’s owned by the Red Sox’ principal owner, John Henry. I’m guessing there would be some corporate synergy here. The mark is subtle; you can imagine it embroidered in a silver-on-white style that barely detracts from the design. Author’s note: This is part of a recurring series on the soccer design aesthetic applied in other contexts. When you’re done here, feel free to read on. Done with all 30 baseball identities? Soccer Out of Context continues with the Ghosts & Grandfathers League series. If you love American soccer, check out The Gadsden, a shirt made for US Soccer fanatics, over at my brand new design shop, Clean Sheet. For more, including how to purchase future design work from the author, follow @m_willis on Twitter or leave your email at the very bottom of this page. Thanks for reading! And that brings up another huge departure for US sports: sponsors. Soccer has them, loves them, splashes them everywhere. Baseball, and other domestic US sports are chaste and pure and could never do such a thing – well, until the balance of money (needs to be higher) and fan backlash (needs to be lower) is right. The groundwork for sponsors in US sport is already being laid by the inroads soccer culture is making here; the domestic soccer league (MLS) has them; when Major League Baseball plays games overseas, it allows them. So I don’t see why teams wouldn’t have them as a part of a soccer identity. 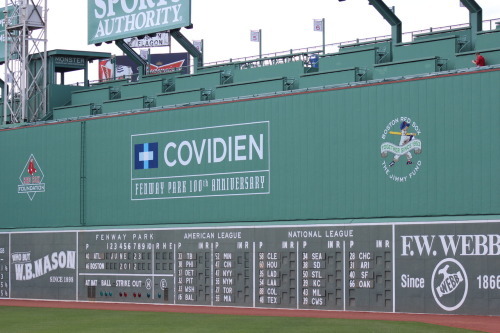 I picked Covidien for the Sox’ sponsor (despite not knowing who they are or what they do – by their logo, I’d guess “refreshingly minty health care solutions”) because their name and logo have been splashed across Fenway Park’s famed Green Monster for several summers running. The logo color picks up that Fenway green, and ties the wall and jersey sponsorship together. 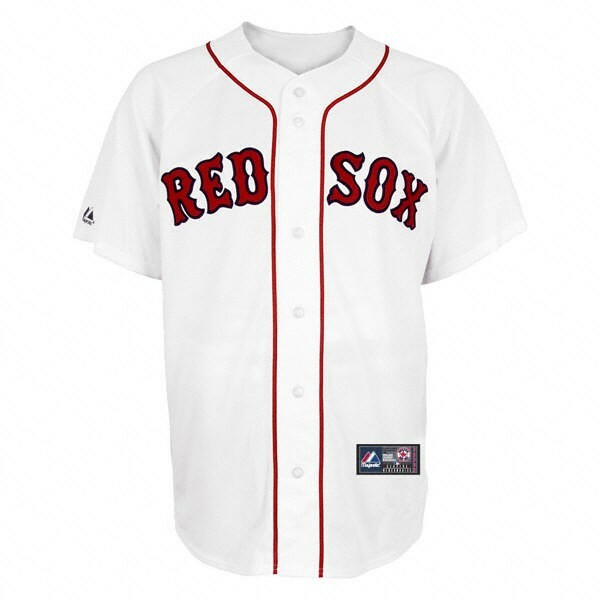 Turning to the jersey back, you’ll find the distinctive Sox number font with the traditional visual treatment, no player name (the Red Sox don’t use them on home jerseys), and the MLB logo placed below the collar. That’s it. Arm and collar trim on the front and the back recalls the sharp red piping on the current jerseys. The kit itself has just a touch of vintage, off-whiteness going on, but other than that, it’s pretty simple. 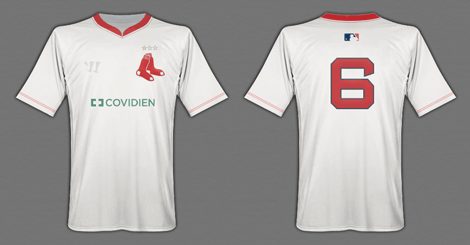 So there you have it – the Red Sox as a soccer identity. Nonsensical but fun. Let’s keep going. Couple things about the Yanks. First, pinstripes. Of course. Second, no front-of-jersey sponsor. Like Barcelona, they’d just never do that (or if they did, they’d test the waters with a charity, and then move deliberately towards “not for profit” organizations who paid out the nose). Third, the only corporate mark you see on the front is a reference to Nike. Again, in a world where clubs fended for themselves vis-a-vis sportswear brands, it’s clear that Nike would be making things for the Yanks. I used the swoosh logo and tried to imagine how it might cleverly blend in with the pinstripes, so as not to draw attention away from the famous NY logo mark. Which, by the way, is a natural for a soccer jersey; the Yanks already use it in that spot, just like a crest, on their timeless home baseball jerseys. (The alternative crest option, the team’s quickly aging bat-and-tophat mark, isn’t getting it done here.) Subtle dark navy piping (the Yanks’ version of blue has really been more black than blue for a long time) completes the look. Above the crest you’ll see an extra insignia – ★ 27 ★ – which (it shouldn’t be hard to figure) is the annoyingly high number of all-time Yankee World Series victories. 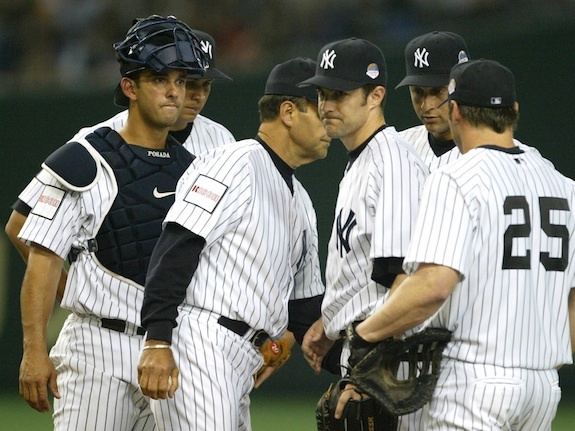 The Yankees are classy, but I imagine they’re not above celebrating their success in a time-honored soccer style. The problem becomes, with claim to almost a quarter of the championships the sport has ever awarded, how to you subtly nod to the real number? You can’t put 27 stars above the crest. An arithmetic combo of two platinum stars (standing for 10 championships each), a gold (5) and two silvers (one each)? Roman numerals? A “dozens and dozens won” mark? 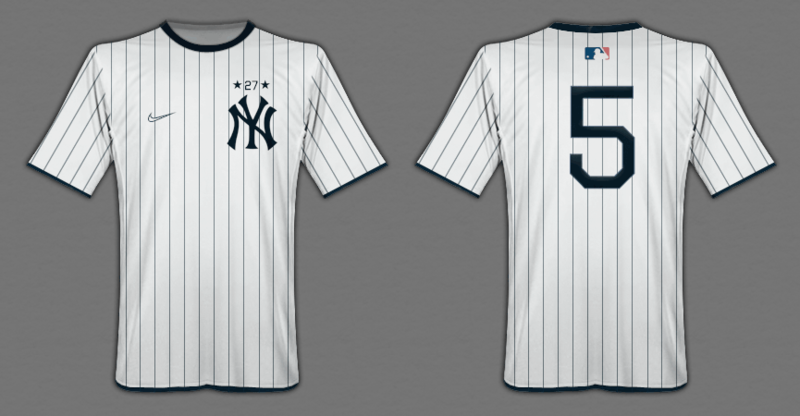 I figured doing a something with the real figure, and a couple of decorative stars, marked the easiest and most future-friendly way to represent the Yankees (damned) success. On the back, same MLB logo, no name (they don’t do that either) and a stock number mark. The end. The Yanks are the apex of American sports branding, so keeping things plain, simple and elegant – in any context – is the way to treat this identity. Let’s keep moving before we start to actually respect them or something. The Jays are fun to think about, because they seem to have a little soccer in their blood already. They hail from Toronto, an international city that loves the sport, and they’ve always seemed a little “European” in that vaguely progressive, eastern-Canadian way. (I miss the Expos, while we’re on the topic.) And the Jays, especially when they were at their peak in the early 1990s, had forward-thinking, almost continental (if you will) design ideas. The hallmark of their style has always been the funky double-bar number typeface they used for many years, until a series of rebrands sidetracked the identity in recent seasons. Happily, the Jays are back to an updated “glory years” look this year, just in time to include it in this exercise. Some keys to this out-of-context identity: first, the diagonal double-sash directly plays off of the Jays’ famous font, and does so in a soccer context. The crest used here is the team’s official seal, not just the bird and maple leaf that you’ll find on their caps, as I feel the many components in that logo call for some enclosing form in a jersey context. The Jays’ kits are made by famous Canadian hipster sports brand Roots, because they have some kind of indefinable cool quotient that I wanted the Jays to take advantage of. That’s the Roots “beaver” icon where a swoosh or striped logo would be. 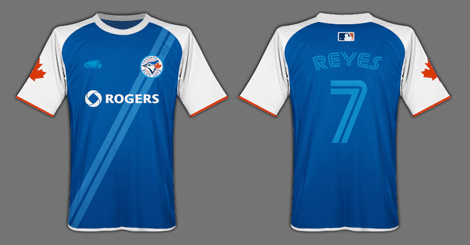 Also, I gave the Jays a heavyweight corporate sponsor (Canadian mobile company Rogers, who sponsors owns the team, and their stadium) that I thought made sense for them. Update 12/20: Now with stars! Out of some kind of subconscious nod to Canadian modesty I neglected to give the Blue Jays any championship stars – and they, of course, are owed two. 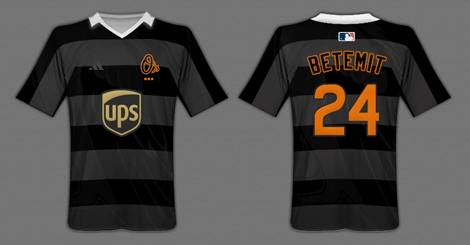 I have included them in a subtle way, as dark outlines against the double-stripe sash, above the crest. That keeps the design intact – and it gives the Jays plenty of room to add more. Which they easily could do this year. Design-wise, I gave this jersey a two-toned pattern, because (as the leaf in their logo attests) the Jays have always been a team playing to two audiences – a civic one, and a national one. The Jays carry the torch for Canada in their sport, and so the white sleeves, leaf arm patch and and red piping reflect that. On the back, the MLB logo, the glorious double-bendy font face, and (finally) a player name are showcased. Author’s note: thanks to some good feedback, I took a second shot at this design in a follow-up piece – but I’m leaving the original here for context. You can check out the “Second shot at the Orioles” piece here, or just read on and circle back. Two-toned black (you can imagine a shimmery charcoal and deep black fabric effect if you’re up to it), a few details (the adidas tri-stripe in subtle grey) and the crest make up the backbone of the look; I went with the cursive “O’s” mark over either of the team’s competing bird marks (one Audubon, one Disney) because it’s my favorite way the Orioles brand the team. I did include the bird in a subtle way, though – the faint texture on the kit is a detail of the ”serious” Oriole’s wing. Three orange dots below the crest signify the clubs’ trio of championships, and do it in an interesting way, using little ‘o’ dots instead of stars. I also imagined that the club would eagerly sign up a sponsor, and thought UPS, with a color scheme that isn’t that organically removed from the team’s, would be a good fit. Also, note the open club collar which maximizes the mid-Atlantic “tennis anyone?” cool factor. 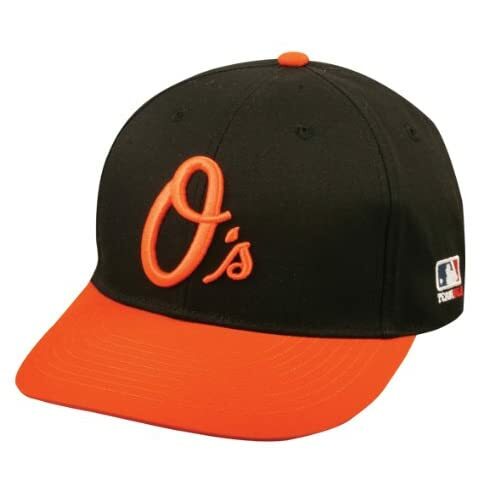 On the back, the name and number differ in treatment to really give focus to the stark orange color effect, and the MLB logo sits in its preordained place. That’s it. The Rays are awesomely suited for this little project. As a semi-recent expansion club, they have no tradition. As, until the last five years, a doormat, they have no history of success. And as an example of schizophrenic mid-90s design, they have every reason to run from their visual past. The Rays are the perfect blank slate identity to work with on an exercise like this. One qualifier: the club plays in Tampa St. Petersburg, where the prevailing design aesthetic is something like “ok, make it aqua, this is Florida – hey, but not too aqua, this isn’t Miami.” They have color issues. The Rays were born into some kind of hologram rainbow nightmare, graduated to dark sea-foam green (kind of aqua) to a mix of blues (also kind of aqua). 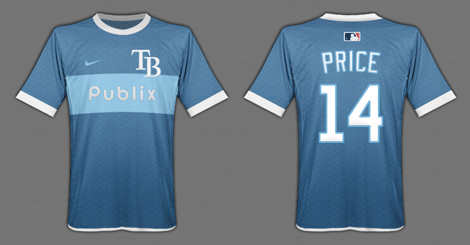 I kept the current blues, but did some blending – knowing Tampa, that’s what they’d want. I also kept the team’s current logomark, which is fine enough, added a middle panel and some shimmery fabric texturing (again, it’s Tampa). I figured the Publix grocery chain, a prominent Florida business, would be a good sponsorship fit, and the back of the uniform is as expected with the white really popping in a nice way (something the Rays could consider on a light blue uniform in real life to stand out a bit). 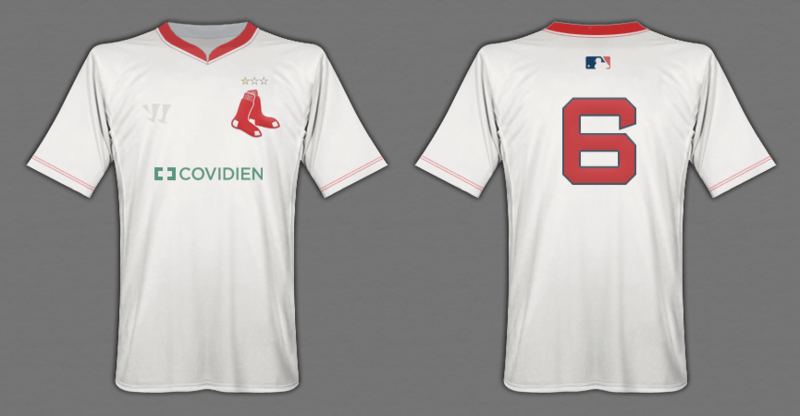 So there you have it – my pointless (but fun) look at Major League Baseball’s American League East – if they were soccer identities. The larger lessons here? I can think of two. One, I wish baseball season would start already. Two, don’t sweat the context. or, leave me your email address in the form at the bottom of this page. I don’t spam, just design. (I’m almost positive there’s a difference between the two.) Thanks again for reading and sharing. – M.
If you made it this far, you might enjoy a few other uniform, soccer and identity-related pieces I’ve put together. First, you can buy original soccer-inspired t-shirt designs at the just-launched Clean Sheet Co – our first shirt is for US Soccer fans, and it’s called The Gadsden. Also check out the series Re-booting the New England Revolution and What Makes a USA Soccer Kit?. I’m also tracking seasonal soccer tables, beautifully, at the Seasons project. If you like tech writing, I do a little of that too now and then. Thanks again!